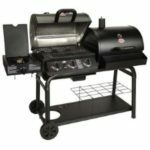 Not sure if you want to cook your favorite meals on a charcoal grill or on a gas grill — this can be a big decision however now-a-days if you simply like using both then you can purchase a Combination or Hybrid Grill. These type of grills are ideal for a household with people who prefer a certain power source while another family member may prefer another. Versatility comes big time with a combination grill. What if you need to grill a quick steak, then you just go with the LP side or maybe you’d rather slow cook ribs for the family reunion, well in that case you fire up the charcoal side of the grill. 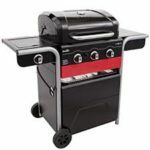 No matter what comes up these combination / hybrid grills are best for any situation. 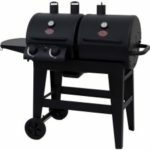 Take a look below and see of any of our 2019 top-rated gas/charcoal grills will work for you. We made sure the best hybrid grills were listed for your convenience so you’ll always have the top quality at your finger tips. 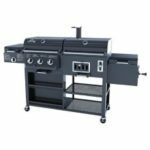 Here is another smaller hybrid unit for those families that need a smaller footprint grill but still want the convenience of a 2-in-1 Gas/Charcoal Grill. This 3 burner hybrid comes with large side shelves and two wheels at the side for easy transport. This little gem also features a nice handy side burner if you wish to fry an egg or two! 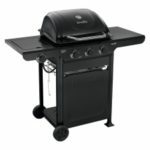 For those who like lightweight grills – this one weighs only 100 lbs., but does require assembly. Total BTU’s on this one is roughly 30,000 and another 12,000 BTU’s from the side burner. Click here to read more about this grill and see if it is your perfect match.